Eating the warm, orange scented cupcake marked a milestone. A bizarre claim for a humble cupcake. But this was no ordinary cupcake. No ma'am, it was my portal to a new world. The world of vegetable cakes! So I have finally moved from admiring this year's favourite Christmas present, Harry Eastwood's Red Velvet and Chocolate Heartache, a book full of gluten free, low fat, vegetable based cakes (see my review here) --to actually making them! That's one giant leap for womankind! I have found it hard to get my head around them. You see, I have a weird phobia... There's lots of things that I love to eat but won't cook: chicken liver pate, seaweed dishes, and the latest addition to this list: cakes made from parsnip, turnip and aubergine. Because if I knew what was in there, then my head and taste buds would be doing battle. And so I took a risk. Butternut based orange cup cakes. Sounds weird, right? Grating the butternut was the downside, 20 mins hard graft on my lousy box grater (she advises doing it by hand, not in a food processor). The mix looked odd going into the cases. But coming out was fragrant and golden. Pure orange cake, nothing dodgy. These got a universal thumbs up from assorted mamas and fussy kiddies from 2-8 year olds. No one guessed their secret. 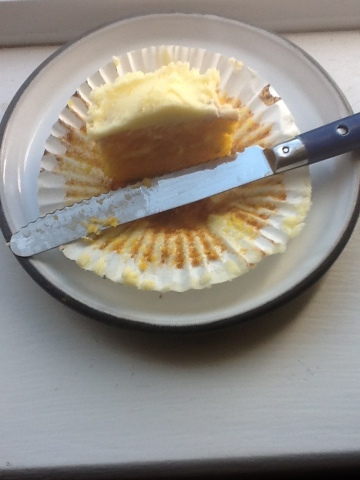 And with no butter, only two eggs and no wheat flour were nutritionally far superior to our normal cupcake recipe. Want the recipe? Then here it is! My neighbour was so impressed, we're going to bake something together from the book next week- so we can share the grating!